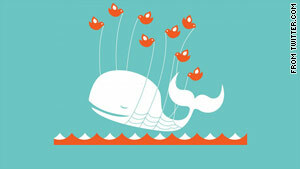 Twitter posts this picture of the "fail whale" when its site has trouble loading. During the crash viewers saw an "extremely high volume of whales"
(CNN) -- The popular site Twitter crashed again on Wednesday morning. The microblogging site was down for about an hour and a half, with service restored at about 8 a.m. ET. During the outage, the site's users saw an "extremely high volume of whales," the company said in a blog post. When Twitter breaks, a cartoon whale -- nicknamed a "fail whale" -- pops up on computer screens instead of the functioning site. The fail whale has become an iconic symbol for Twitter, and a way for the company to try to embrace and make light of its shortcomings. "A sudden failure coupled with problems in switching to a backup system produced a high number of errors for around 90 minutes," Twitter wrote in a post to its status blog. "This made the site largely inaccessible. No data was lost or compromised during this outage." Wednesday's down time was the first major outage at Twitter since it and other sites were attacked in early August, according to reports. "Reliability has been an ongoing project for Twitter as the service has scaled up to handle growing traffic," Rich Miller wrote on the blog Data Center Knowledge. Mashable's Ben Parr wrote that news from Haiti may have contributed. "What exactly took down the microblogging service, we don't know (some speculate that a wave of tweets due to this morning's 6.1 earthquake in Haiti could be partly responsible)," he wrote. On Twitter, some users made light of the situation after service was restored. "@BillGates joined the twitterverse," one user wrote. "Rough seas out here, I hope the Fail Whale won't eat him :P :D"
Twitter, a Web site where users post 140-character messages to their public followers, was founded in May 2007. It grew at breakneck pace last year and experienced a number of outages as a result. Some online writers have speculated that the Web site's traffic has started to slow or decline in recent weeks. In a Twitter post on January 12, company CEO Evan Williams wrote that the site continues to grow. "Across all metrics that matter, yesterday was Twitter's highest-usage day ever. (And today will be bigger. )," he wrote.